The Fashion Show Mall in Las Vegas is a fun place to shoot a Fashion Show every weekend They have a 10 minute show that features a store in the mall every hour on weekends. The catch is: you cannot take a huge camera into the mall and expect to shoot. I have been asked to leave using a 6D with a battery grip and the Sigma 24-105mm Lens. When I talked with security about why I was asked to leave but many other people that were shooting pictures were allowed to stay, his reply was I had a “professional looking” camera and that I was the only one that looked like a professional. I later confirmed that same policy with Mall Administration and was told anyone can take photos as long as their camera did not “look professional”. Since then, I have been in the mall shooting with my Canon 70D and the Sigma 85mm f/1.4 lens, but with no grip and no lens hood – and guess what? I did not get asked to leave. I actually shot an entire show (they have one every hour from 12-5pm Friday – Sunday) standing pretty close to a security officer. Now I have not been in the mall in some time, but decided to take the Sony A7II with the Zeiss 24-70 this weekend and see how it would perform. I wanted to try the Focus-Following feature and also see how it would do with the lighting conditions that the Runway has on it. I removed the Lens hood to make the camera look even smaller in my hands than normal, and stayed for an entire show. 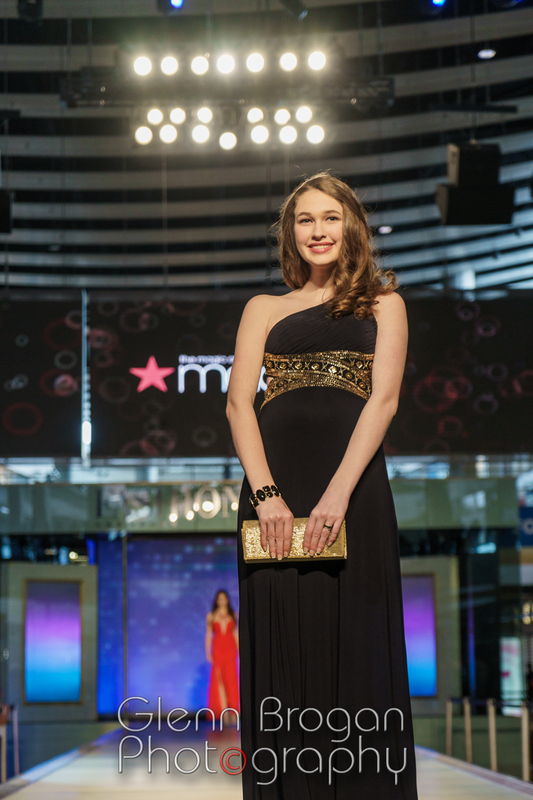 This weekend, the Fashion Show was from Macy’s and was all Juniors dresses (probably going after the Spring Prom market). The lighting was actually better than I have seen it here in the past, but still is mostly lit from directly above and behind the models as they walk towards the end of the runway. There are huge LED panels that flash the name of the store during the show, and no front lighting on the models. I set the Sony camera to Continuous Focus and to Focus Track the subject that I select. I was in Manual Mode and my core settings were f/4 and 1/250th of a second (to prevent motion blur as the models were walking), and Automatic ISO. The ISO settings in the images fluctuated, but mostly stayed within the 200 – 640 range. The focus tracking was really easy to set up and use and actually tracked each model accurately as they walked towards my position at the end of the runway. I did notice that if I let my finger off of the shutter, it did take a second to re-focus and sometimes that would cause me to miss the shot I was going after, but for the most part the focusing system was fast and very accurate. Here are a few images that I captured from the show. I hope to soon take it to a concert soon to see how it does in extremely low light conditions. Overall, in comparing my images with past ones I have shot at the Fashion Show Mall, I would have to say that the Sony has much more depth and a higher dynamic range in camera than the Canon 6D and 70D. The Focus Tracking is very impressive and was easy to learn how to set up. I also think the focus system is more accurate than that of the 6D and seems similar in speed and accuracy to the 70D. The more I use the Sony, the more I learn what it can do. There are so many features, and only so many places to put buttons, so Sony has made it easy to customize each button to a vast assortment of settings that normally would be found in the cameras menu. Oh, one last thing… as far as “Professional Looking” camera – the Sony has a 4mp advantage over the Canon and is smaller and lighter. It has a great feel and the grip does fit to my hands for the most part. I do wish I had the battery grip, for a vertical shutter release, for an even better feel in my hands, and also for the extended battery life. Note: Images were white balance corrected and cropped and my watermark was added. No other post-processing was involved.